Technology is awesome and it’s getting wilder and better by the day, as the world enters the age and time where small gadgets and software gain the ability to compensate for humans’ disabilities, in ways we couldn’t event begin to imagine 10 years ago. 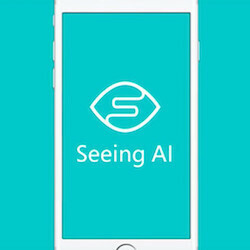 In this sense, Microsoft has just released an iOS app, called Seeing AI, which is able to narrate the world around you and do a lot more, obviously aimed at easing life for people with visual disabilities. However, the app seems kind of fun for anyone to just try and experiment with, irrespective of your visual capacities. Seeing AI is able to read out loud small or big texts, and even documents, by just pointing your iPhone or iPad’s camera at the page or sign. It can also read barcodes, recognize product packages and tells you details about a product, making all kinds of shopping a lot more accessible to visually impaired folks. But it doesn’t end there. The app is also able to recognize and save information about people’s faces, and also gives you estimates about their age, mood, or relative location to yourself. Face recognition is definitely a hot topic that many tech manufacturers have been exploring in recent months, with rumours that the upcoming anniversary iPhone might sport it. Furthermore, Microsoft’s AI app is able to read whole scenes and vocally brief you about what surrounds you, but this particular feature is still in early preview. To top it all off, the app is completely free and Microsoft is apparently working on even more features that will be added later on. The app is compatible with iOS 10 and later versions, but we don’t know whether or when Android fans can expect to see it on Google Play. Seeing AI currently only available in English in the US, Canada, India, Hong Kong, New Zealand and Singapore, but we do guess that Microsoft will expand its accessibility with more countries and languages with future updates.